As a man, you need an effective exfoliating face scrub to keep your face clear, fresh, and manly. Because, your facial skin has to face more dirt, impurities, debris, excess oil, etc. from the outer environment. Beside exfoliation, scrub also gives some other benefits to your skin. Famous dermatologist Jeannette Graf says,”Exfoliating can help skin-care products penetrate 20 percent better”(S). 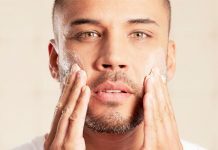 Today, I listed some best exfoliating face scrubs for men’s dry skin. All are made with quality ingredients and best at their task. They not only exfoliate but also nourish your face. They deliver proper nutrients to the dry skin and cleanses without drying. Some scrubs greatly moisturize your face. Just pick one and get a manly refreshed clean face. The key ingredients of this facial cleanser are aloe vera, vitamin C, willow bark, and burdock root. It provides complete care to men’s skin with its natural and organic ingredients. RUGGED & DAPPER Daily Power Scrub Facial Cleanser for Men is ideal for all skin types. You will get a multi-purpose face wash, toner, and exfoliator in one container. It attacks dirt, excess oil, and grime to eliminate congestion and breakouts. It also soothes and nourishes the skin while exfoliating your face. This facial cleanser moves away dead skin cells and excess oil to ensure deep cleansing. The core elements of this face product are volcanic ash, adzuki bean powder, rice bran, walnut shells, and goat milk. It is specially made for men’s skin. Kyoku For Men Exfoliating Facial Scrub tones nourishes and exfoliates to give a glowing face. This scrub removes dead skin cells and minimizes large pores. It also reduces the formation of fine lines and wrinkles. It treats also men’s acne. It is a men’s scrub that cleanses, energizes, and rejuvenates the facial skin. It comes with pumice, avocado, and jojoba for a perfect and gentle scrub. 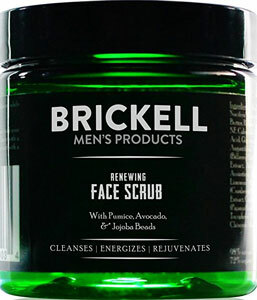 Brickell Men’s Renewing Face Scrub is completely natural and organic. It removes dead skin cells, excess oils, and other facial impurities to restore a clear complexion. This face scrub is perfect for all skin types of all ages. It takes special care to the skin which is prone to buildup, blackheads, and ingrown hair. It is a luxurious exfoliating face scrub for men. You can use it as a pre-shave cleanser for a smoother shave. It is formulated with premium natural jojoba beads for gentle exfoliation. It removes dead skin cells and grimes from your face to reveal smooth, healthy, and younger face. Lather & Wood Face Scrub is a great cleanser for oily, normal, and dry skin. It removes debris from pores and unclogs hair follicles. It doesn’t dry out skin. This facial scrub is packed with arabica coffee and other premium natural ingredients from Costa Rica. 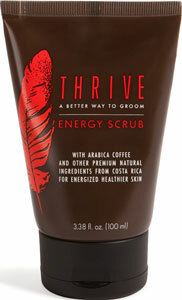 Thrive Face Scrub for Men helps you to get energized healthier skin. Free from artificial ingredients, synthetics, colors, and fragrances. It helps to protect your skin from stress and irritation. It removes excess oil, sweat, SPF, and other impurities from your face. And this face scrub doesn’t dry out your skin. Regular use will improve the skin’s overall condition and texture. The key ingredients of this face scrub are olive stone, horse chestnut; zinc PCA, L-Arginine, aloe vera, and grape seed oil. It gently exfoliates and smoothes your skin. It also hydrates and soothes your skin. ManCave Olivestone Face Scrub controls excess oils. It effectively removes dead skin cells and impurities from your face. It reduces the appearances blocked pores, blackheads, and ingrown hair. This scrub protects your skin with its anti-microbial properties. Try it regularly for a clearer facial skin. This facial cleanser deeply cleanses for a smoother and softer skin. It comes with a new refreshing feel. 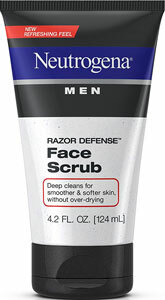 Neutrogena Men Razor Defense Face Scrub cleanses your skin without over drying. It cleanses dead skin cells, dirt, and oils from your face. This scrub conditions the skin and helps against razor irritations. It softens facial hair for an easier and closer shave. This face scrub is dye free and oil free. And it won’t clog pores. This face scrub is specially formulated for daily use. This facial scrub comes with activated charcoal and vitamin C for advanced cleansing action. It rejuvenates and refines the face skin for a healthier complexion. Armor Leaf Daily Scrub Facial Cleanser contains balanced ingredients that make this scrub perfect for all skin types. It is suitable for both men and women. This facial scrub is rich in antioxidants that keep your skin safe from free radical damage. It is made in the USA. And Sulfate free, paraben free, and completely vegan. The key ingredients of this facial scrub are aloe vera, chamomile extract, and vitamin E. it removes the dry flaky skin from your forehead and cheeks. It is also effective on acne scars, stretch marks, sun damage, dark spots, dead skin, fine lines, and wrinkles from your face and eye area. 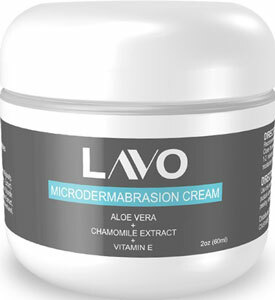 Lavo Microdermabrasion Cream Facial Scrub will not abrade the skin. It melts away dead skin cells to give you a beautifully refreshed skin. This scrub soothes and conditions your skin. It is a nice scrub with pumice and essential oils. It is a perfect scrubber for the face. You can use it on your body as well. It removes common causes of skin irritation, body odor, dead skin, and blemishes. It also draws out impurities, toxins, makeup, and pollutants from your skin surface with activated charcoal. Oleavine Therapeutic Exfoliating Scrub is usable for both men and women. This face scrub soothes itchy, scratchy, dry, and inflamed skin with nourishing botanicals. These are the best exfoliating face scrubs for men that you should use for a manly look. It perfectly removes all impurities from your face. You can use it daily to clean your face. If you can’t, use at least 2-3 times a week for a fresh face. Don’t forget to apply a moisturizer after every scrubbing. And drink plenty of water daily to keep your skin healthy. A Beauty Editor at FaceCareTalks. Doing graduation. I am passionate about all things of beauty, makeup, and skincare. In spare time, keep eyes to the latest trends of makeup. When I am not in writing, busy with my younger brother and in the garden.